DyNaMik Records Ltd Ireland to release Ninni & Mika's EP Love Will Come Around on 19th October 2016 to coincide with their mini UK tour. Ninni & Mika are coming to the UK 24th October 2016 on the back of Love Will Come Around's success in Finland. Think twined harmonies, inspired musicianship & fiercely intelligent lyrics. Love Will Come Around shifts from the mesmerising to the poignant, harvesting a musical terrain that rewards the listener with the duo’s unique meld of folk, roots, blues, Americana and country. 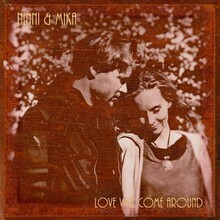 Recorded variously at the late Levon Helm’s studio in Woodstock, USA with Grammy winning engineer Justin Guip, Sydney’s Monstereo Studios and Eastwing Studio in Jarvenpaa, Finland, Love Will Come Around features Ninni (vocals and violin), Mika (vocals and acoustic guitar) and leading Finnish and Australian players including ARIA & Golden Guitar winner Bill Chambers and Esa Kaartamo on electric guitars, David Jones on drums, Ashley Turner on bass, Olli Haavisto on dobro and Pekkaa Grohn on bass. Day two 25th Oct - Appearing at secret locations to be confirmed.